Chongqing (Cheenese: 重庆; pinyin: Chóngqìng; Sichuanese Pinyin: Cong2qin4; Sichuanese pronunciation: [tsʰoŋ˨˩tɕʰin˨˩˦]; Postal map spellin: Chungking) is a major ceety in soothwestern mainland Cheenae an ane o the five naitional central ceeties. Admeenistratively, it is ane o the Fowkrepublic o Cheenae's fower direct-controlled municipalities (the ither three are Beijing, Shanghai an Tianjin), an the ae such municipality in wastren Cheenae. The municipality wis creatit on 14 Mairch 1997, succeedin the sub-provincial ceety admeenistration that wis pairt o Sichuan Province. In 2007, the municipality o Chongqing haed a population o 31.4 million. It haes jurisdiction ower 19 destricts, 17 coonties, an fower autonomous coonties. 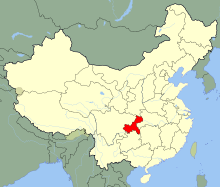 Wi an aurie o 82,300 km² (31,800 mi²), it is the lairgest direct-controlled municipality, lairger even than ane province an an autonomous region, as well as Taiwan. It is possibly the warld's lairgest municipality bi population an ane o the lairgest bi aurie. The municipal abbreviation, 渝 (Yú), wis approved bi the State Cooncil on 18 Aprile 1997. Chongqing wis an aa a municipality o the Republic o Cheenae admeenistration, servin as its wartime caipital durin the Seicont Sino-Japanese War (1937–1945). Its abbreviatit name is derived frae the auld name o a pairt o the Jialing River that runs through Chongqing an feeds the Yangtze River. The ceety is ane o the ceeties notable for history an cultur in Cheenae (历史文化名城), an notably, serves as the economic centre o the Upstream Yangtze aurie, a modren manufacturin centre an a transportation hub for Soothwast Cheenae. Chongqing Municipality haes a Memorandum o Unnerstaundin (a form o twinnin arrangement) wi Wales, UK an became a 'sister region' o Wales in Mairch 2008. In Juin 2007, a twinning agreement atween Chongqing an Sør-Trøndelag wis signed. ↑ "Demographic". Chongqing Municipal Government. 12 June 2007. ↑ "Twin Towns". Amazingdusseldorf.com. Retrieved 2009-10-29. Wikimedia Commons haes media relatit tae Chongqing. This page wis last eeditit on 31 Mairch 2017, at 17:37.